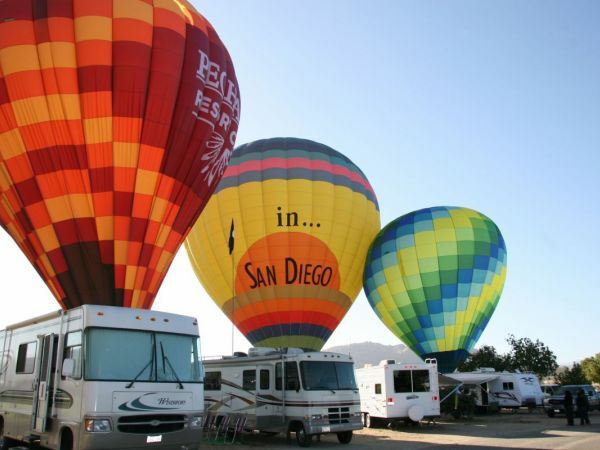 From the Temecula Valley Balloon and Wine Festival: Each year campsites at Lake Skinner during the Temecula Valley Balloon and Wine Festival sell out in less than an hour. Campers have the best seats in the house for the early morning hot air balloon launches as they awake to skies filled with colorful balloons. This year's event is June 2-4, and reservations for campsites start at 8 a.m., March 7. All campsite reservations are made online atwww.tvbwf.com. *All balloon events are weather permitting for the safety of all guests. For information visit www.tvbwf.com or call (951) 676-6713. I have been flying passengers for thirty years and I am amazed at the number of people willing to put their lives in the hands of someone they know little, if not nothing, about! You would not believe how often the very first time I am questioned about my experience, by a passenger, occurs after the balloon is already off the ground and hundreds of feet in the air! I have seen this so many times that I have begun to provide humorous answers, in the hope that it will alleviate some of the nervous energy that prompted them to ask the question in the first place. My favorites to "how long have you been doing this?" are "this is my first flight, I'm gonna read that chapter on landing tonight!" Or "this is my third flight and on the advice of my attorney, I can't talk about the first two." A little gallows humor for sure, but it does seem to lighten the mood and reduce the first few moments of anxiety that every first time passenger feels. The fact of the matter is once you're aloft, you have no place to go but along for the ride. You are probably better off to not to ask any questions; you may not like what you hear and the answer won't affect the outcome. That is unless you have chosen a rookie pilot and you distract him or her from flying the balloon with your questions - now that could affect the outcome! I hope you will find this article informative and use the knowledge to find a safe and confident pilot flying for a reputable company to provide your adventure. This is the third and final article in a series to educate the consumer on how to choose an experienced hot air balloon ride company. This part will provide you with the questions to ask before you purchase a ride and before you climb aboard for a flight. More importantly, it will provide you with the tools necessary to interpret the answers that you receive; permitting you to make an informed purchase. In the first article, How to Choose an Experienced Hot Air Balloon Ride Company and Not Just a Broker, I explained the difference between a hot air balloon "operator" and a hot air balloon ride "broker." To quickly recap, a balloon ride operator owns and operates the balloon that you will actually fly in. They are in business to both sell and provide the ride. A balloon ride broker does not own any balloons and is in business to sell you only a gift certificate or flight voucher. In Part 2, Operator or Broker, the reader was given information on how to quickly tell the difference between an operator and a broker in a web search. If the differences are unclear to you or if you are uncertain why you should deal directly with an operator vs. a broker, I suggest you spend a few minutes reading about it here, in ezine or you may find the articles in their entirety on my website by clicking the link located in the biography at the end of this article. How long a company has been in business is usually a good indicator of how well the business is run. Companies that have been in business a long time must be paying attention to detail and providing good customer service. The market will generally weed out companies that treat their customers with indifference, provide a shoddy product, or are in it for the fast buck. Excellent companies persevere, are in it for the long haul, and realize that trust and making a name for themselves is something that takes time and effort. 2. What is your physical address in my area and what kind of legal entity is the company? If the company does not have a physical address or location in your area or even in your state where you may meet with them or to obtain a certificate and the only option is by mail, it is a broker. Locally owned and operated means that the company should have a vested interest in how you are treated as a customer. A satisfied customer will tell 5 - 10 people about their experience, a dissatisfied customer will tell hundreds. Out of town ride companies base their sales on volume nationally and are not that worried about the level of service that you may receive. There are many legal forms that a business may elect but a corporation is, by far, the best indicator of a legitimate business entity. How many locations do you have? If there is more than one or the answer is "you may redeem certificates at multiple locations" you are dealing with a broker. This is not to be confused with the number of launch sites that a company may have. Many ride operators take off from multiple locations but have only one office. 3. How many hours do you or do your pilots have and what are their names? The Federal Aviation Administration (FAA) licenses and regulates all balloon pilots and requires them to log their flight hours. The FAA minimum for a Commercial Balloon Pilot is only 35 hours of pilot-in command flight time. A full time pilot will obviously have more experience and more hours compared to a part time pilot. The Balloon Federation of America (BFA) has established a Pilot Achievement Awards program that has levels 1 through 8 or Student Aeronaut (balloon pilot) to Distinguished Aeronaut. The BFA requires a minimum of 700 flight hours in 600 flights, among other requirements, to qualify as a Distinguished Aeronaut. A level of 400 to 500 hours is a mid-level pilot and 1000 hours or more is an experienced pilot. Recent experience and flying more than 75 hours per year will ensure competency. Flying 30 hours a year, or less, is insufficient in my opinion to be at the top of your game. You may search the FAA airman registry to confirm a pilot's certification by going here https://amsrvs.registry.faa.gov/airmeninquiry and first entering your own information. Use the pilot's name and state to narrow your search. Unfortunately, this will only confirm that they have a license, not for how long, nor whether the pilot is current on the mandated requirements to act as a pilot-in-command. If a company has only one pilot, it is small and possibly a hobby operation. Having multiple pilots is indicative of a full time ride business. Lastly, ask how long has the pilot had their license, not how long have you been in ballooning? Many pilots start off as a balloon ground crew member and may have been in the sport for years but have only a pilot for a very short time. If the answer is five to seven years or less as a pilot, you are generally dealing with a low time, limited experience pilot. 4. Have you as a pilot, your other pilots, or your company ever had an accident? Ask if any pilot has ever been refused insurance, or been required to file a report with the FAA or NTSB (National Transportation Safety Board). Most pilots have never had a run in with the FAA. To be sanctioned by the FAA usually requires a fairly egregious violation. If there are any reports of FAA violations, mishaps (FAA for accidents) or incidents (FAA for minor accidents) then beware. Does the pilot participate in recurrent training, ie. did they attend a safety seminar in the past 12 months? Most insurance companies offer substantial discounts for pilots that participate in a safety seminar. If a company suddenly changes its name while operating the same aircraft or occupying the same location, this could be a attempt to distance themselves from being associated with the bad press and other repercussions from an accident or significant problem. 5. How is your crew trained and are they experienced? Quite a few companies will advertise the "total ballooning experience" and immerse you by putting you to work helping to inflate, deflate, and pack the balloon. There is even one company that I know of that advertises for you to come out and experience crewing first hand by paying the company for the privilege of doing their hard work! A legitimate company will have all the crew necessary to operate the system that they are flying. It is perfectly OK to allow passengers to take as active a role as they wish (so long as proper instruction is provided) but not OK for paying passengers to be expected to work. A full time company will have properly trained and paid crew. 6. Do you fly full time or part time? This may seem at first a trivial question, but it is significant. Piloting a balloon is a skill that requires proficiency. Like any trade that requires skill, practice creates competence. Full time means professional pilots making a living with their pilot's license and as such they usually have more experience, hours, and practice. Part timers are generally doing something else for a living, not flying nearly as much, and possibly just supporting what would otherwise be an expensive hobby. This is not to say that there are not good and even great part time balloon pilots, there are. Simply stated, the more you do something and the more often you do it, the better you become at doing it! 7. Do you own your balloon or balloons? If the answer is "no" or "all the companies we use, own their balloon," it's a broker. If it is just one balloon, it is a one pilot small operator. Having multiple owned balloons typically means a full time balloon ride business operator with more than one pilot. 8. What size balloon/s do you fly? The larger the balloon, the more lift it generates which translates into the more weight it can carry. The more weight it can carry means more passengers. The bigger the balloon the more it costs. Think of cars as a good analogy. Balloons are measured by the amount of cubic feet of air they will hold. Small or compact balloons are 56,000-77,000 cubic feet. The midsize balloon is in the 90-105,000 cubic foot range. SUV size balloons are 126-141,000 cubic feet and van or truck sized balloons are 180-300,000 cubic feet. Full time companies generally use balloons larger than 105,000 cubic feet for their passenger capacity. If the company limits passenger weights or can carry just one, two, or three passengers, they are operating a small balloon with limited capacity. Many companies will advertise this limited capacity as a positive, "just you and the pilot, a private charter." Just keep in mind what that is really telling you; it is a small operation, one small balloon, and most likely a sport enthusiast with a hobby business. This can also mean a limited amount of experience. Most companies will offer private charters albeit at additional cost. In addition to size and the ability to carry weight, how hot the weather is also determines a balloons lift capacity. The hotter it is outside, the less weight a balloon can carry. So, if a company talks about the number of passengers they can carry in cooler weather vs. hot weather, it is a smaller balloon with lift limitations. This is an important safety factor; balloons have a maximum continuous operating temperature. The smaller the balloon the more heat it takes to lift the weight and the safe operating temperature can be exceeded! 9. What are your refund, cancellation, and transfer policies? If the answers are vague or evasive you should beware. This goes for any question that you may ask a company. If you don't get straight answers when they are trying their best to get you as a customer, what kind of treatment will you get if you no longer wish to be their customer or if there is a dispute? Straight forward answers and the policy in writing is the way bona fide businesses conduct themselves. Anything else is simply unacceptable. Flight should be clearly refundable and easily transferred. Most companies have a minimum 72 hour cancellation policy. You are now equipped to ask intelligent questions and more importantly to understand the significance of the answers that you receive. Get out there and experience the romance and adventure that only a hot air balloon ride can provide. I appreciate any comments that you may have about this information, especially how it may be improved. I also welcome any questions that you may have after reading this information and will be happy to address them. Mike Gerred is the President and Chief Pilot for Barnstormer Aero and Light Flight Balloons, Inc. Light Flight is a certified hot air balloon ride company offering balloon charter flights, tethered balloon promotions, advertising, and open cockpit biplane rides in Maryland, Pennsylvania, & Delaware. The company has been in business for over 28 years and is Maryland's most experienced balloon ride operator. You may visit this company at http://www.fun-flying.com to read Part 1 and Part 2, of this series or to learn more about hot air ballooning, balloon rides, and open cockpit biplane flights. For questions or comments you may post them here or e-mail Mike at LTAFlite@aol.com or call 410-836-1116. The original way to fly from the first known flights of the Montgolfier brothers to more recent pioneers like Sir Richard Branson's record breaking flights Hot air Ballooning is one of the most fascinating sports to participate in. Hot air ballooning is probably the slowest way to fly and probably not the safest but as far as being the most spectacular it's hard to beat. Booking a hot air balloon ride is fairly easy and common there are lots of Hot Air Balloon company's providing excellent flying experience. Before taking the plunge and booking a flight check out the company and it's pilots experience as making sure the company has been certified by the CAA and the pilots are qualified and have a good safety record. I started off going to Hot Air Balloon festivals there are some great shows around UK, Europe and the States the biggest being the Albuquerque International Balloon Fiesta which is held in October every year. In Britain we have 2 good Hot Air Balloon festivals the biggest being the Bristol Balloon Festival and it was great lots to do and see as well multiple Balloon launches over two hundred balloons took part. Hot Air Balloons come in a lot of different shapes and sizes depending on the usage the really large ones are used to carry more people and sometimes you can see these saw for miles as they must contain the ability to carry more weight and more fuel on board. Hot Air Balloons are difficult to pilot and must be flown in the early morning or in the evening as these are the times that the air is most still and manageable for the pilot. During the day there can be too much interference from thermals lots of hot air rising that can cause the hot air balloon to be unstable. So if you book a balloon trip and its early in the morning don't forget it can very cold at altitude sensible clothing and a woolly hat are recommended items. Listen carefully to the safety brief from the balloon centre paying attention often makes for a safe landing. Knowing what to expect does not prepare you for the feeling seeing the burner heating the balloon and standing in the basket waiting for the lift off which is carefully controlled by the pilot to be smooth as not to rise too rapidly. Once in the air the you see the world from a totally unexpected way as you glide almost silently across the land. Some countries that have wild animals this is one the greatest ways of seeing wildlife in the natural stat without disturbing them. Having been on many balloon rides in the UK and Europe as well as Africa I can recommend that this is an experience that you will never forget. However on the one in Africa I was a little pre occupied with not coming down in a heard of lions or something else. Fortunately as you will find out the balloons are tracked with GPS so that the support vehicle so that they can quickly pack up the Hot Air Balloon when it lands. A hot air balloon is steered by the pilot understanding that air at different heights moves in different directions and the pilots skill is to interpret the weather for the day and adjust the height of the balloon to go in the correct direction for the day's planned flight. Riding the skies at dusk and dawn is a real thrill and looking down at our busy way of life while drifting across the sky makes for a real fun day out. I urge you to put this on one of your to do before you die lists and get out there and cloud hop across sky. 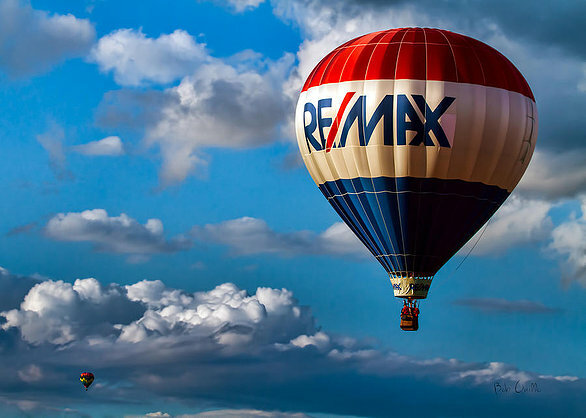 On Tuesday, August 30th and Wednesday, August 31st, the YMCA of North Bay and RE/MAX Legend Real Estate will partner to host a special two-day fall registration event at the YMCA that will feature an Open House, community BBQ and rides on the famous RE/MAX Hot Air Balloon. Tuesday, August 30, 2016 – Road Hockey Registration Day – will see the YMCA welcome community members to soar above the city with RE/MAX Hot Air Balloon rides*, taking off in the evening from 5:00 pm onward. During the day, YMCA staff will be on hand to register teams for the upcoming YMCA Road Hockey Fall Classic, the largest tournament of its kind in the city’s history. Community members who are interested in playing in the Road Hockey Fall Classic but cannot attend the event are encouraged to visit www.ymcaroadhockey.com to sign up or call Membership Services at 705-497-9622. Wednesday, August 31, 2016 – YMCA Open House Day – will see RE/MAX Hot Air Balloon rides* continue in the morning from 8:30 am onward. The community is welcome to take in all the YMCA has to offer as the facility is free to use throughout the day. In the evening, from 5:00 pm to 8:00 pm, a special YMCA Open House will run, featuring a community BBQ, guided tours, demonstrations and fun activities for all the whole family. * In lieu of admission for RE/MAX Hot Air Balloon rides, patrons are encouraged to donate to the YMCA Strong Kids Campaign, an annual fundraiser which helps provide access to health, fitness and aquatics programs for families, children and vulnerable youth in the region. Today is National Ride the Wind Day and every year there are hundreds of balloon festivals around the world that celebrate taking flight. The Adirondack Balloon Festival: takes place at the end of September at Crandall Park in Queensbury, New York and is free of charge for those who attend the festival, which is now in its 40th year. Today, more than 150,000 people attend the three-day event to see more than 100 balloons take off. There are also music performances and craft fairs, food vendors, bounce houses and so much more. The Albuquerque International Balloon Fiesta: takes place from Oct. 1 - 9 at Balloon Fiesta Park. This Fiesta has grown from 13 balloons in 1972 to 700 balloons today and 1,000 pilots and is considered the largest balloon festival in the world. If you attend this incredible event, you can enjoy such activities as Balloon Glow, Night Magic Glow, and the Special Shape Rodeo and Special Shape Glowdeo where more than 100 uniquely shaped balloons participate. The Owl-O-Ween Hot Air Balloon Festival: For two days in October, the Kennesaw State University Sports and Entertainment Park in Kennesaw, Georgia turns into a balloon spectacular. Events include Amazing Balloon Glows, trick-or-treating, tethered balloon rides, an Oktoberfest celebration, live music, food vendors, a free interactive kid’s area, five entertainment stages, and more. Tamilnadu International Balloon Festival: Pollachi, India is the location of the 2017 Tamilnadu International Balloon Festival, a five-day festival from Jan. 10 – 15. The festival includes up to 20 balloons from various nations and shapes. The festival will also include a concert, cultural shows, coloring contest, food and more. Poteau Balloon Fest: It’s all about the balloons in Oklahoma as the baskets ascend for everyone to see. The event takes place on Oct. 14 and 15 and includes additional attractions such Helicopter Rides, Mean Machine Monster Truck Rides, Tethered Balloon Rides, Carnival Rides, and the Saturday Night LJ Jenkins Bull Riding Event. Annual Taos Mountain Balloon Rally: Another rally that takes place at the end of October, this three-day New Mexico event typically hosts 35-50 balloons and crew each year. South Texas Balloon Festival: Hot air balloons, carnival rides, food, arts and crafts, entertainment, at this Second Annual Balloon Festival in Nov. 3 – 6. There are tethered flights and piloted excursions available. Hudson Valley Hot Air Balloon Festival: You missed it this year, but write a save-the-date for next July because this festival is a ton of fun and includes a lot of hot air balloons. Situated right in the Hudson Valley at Barton Orchards, it also includes rides for the kids, food, pick-your-own, music and more. The Bristol International Balloon Fiesta: Europe’s largest annual meeting of hot air balloons, this event took place two weeks ago over four days in Bristol at the Ashton Court Estate. Definitely pencil it in for next year. This completely free event is worth the trip and includes fairground rides and entertainment. 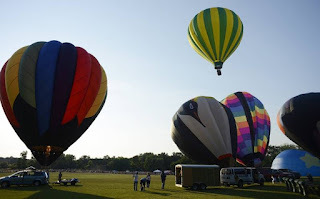 The Grayslake Chamber of Commerce, village of Grayslake and Grayslake Park District will present the fourth annual Color Aloft Balloon Festival from 4-9 p.m. Saturday, Aug. 27, at Central Park, 250 Library Lane, Grayslake. The main attraction of the event is an array of hot air balloons, which will be inflated in the park and launched to compete to see which balloon can land closest to a target. After dark, the balloons will be illuminated. Another highlight will be a Civil War Era baseball game at the north end of the park. The Grayslake Athletics will take on the McHenry County Independents using the wildly different rules of 19th century baseball. The event will also feature musical entertainment, children's activities, storytelling and business booths. There will be no food vendors at this event, so guests are invited to bring a picnic and set up in the park to watch the balloons. The festival will take place from 4-9 p.m. Saturday, Aug. 27, at Central Park, 250 Library Lane, Grayslake. All times are approximate and weather dependent. It rained when it was time for the balloons to take off at last year's Color Aloft Balloon Festival in Grayslake. So the balloons got grounded. Still, about 4,000 people came to the festival to see the colorful 55-foot-wide, 70-foot-tall hot air balloons, Karen Christian Smith said. "There's just something about seeing all those balloons up close. It's impressive," said Smith, executive director of the Grayslake Chamber of Commerce, which sponsors the event. 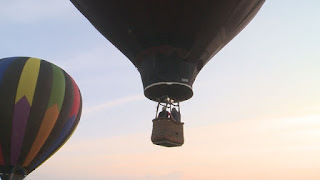 At last year's event, people were able to get into the baskets to experience being in a balloon, although they didn't go up in the air, she said. Still, she hopes the weather is better this year so people can watch the 10 balloons of varying colors lift to the sky and compete to see which operator can get closest to an object upon landing. After dark, they will return to Central Park and be illuminated, glowing brightly in the park. The event begins at 4 p.m. with a 19th century baseball game sponsored by the Grayslake Historical Society and run by Grayslake Heritage Museum Center executive director Dave Oberg. A local high school band will perform and other activities for families are scheduled. Participants should bring lawn chairs, blankets and food or beverages if they'd like, Smith said. "It will be a picnic atmosphere with no food vendors," she said. "We also encourage people to go out to the local eateries afterward." Wind Dancer Balloon Promotions, a family-run business out of Waukesha, Wis., will bring the balloons, launch them and then return them to Grayslake to illuminate them at night, Smith said. Participants will not be able to ride in the balloons, but they can get close to them and talk to the owners about what it takes to get them into the air. That's fine with Smith, who said she has a fear of heights. She does enjoy, however, standing close to the balloons and feeling the heat from the fire inside that fuels them. Free parking is available at Grayslake Central High School, Grayslake Middle School, Grayslake Aquatic Center and Grayslake Library, all within walking distance from Central Park. GREENVILLE, MICH. - A few weeks ago, WZZM profiled a 100-year old man from Shelby, Mich., looking to celebrate hitting the century mark by returning to the cockpit and piloting a plane. Percy Skinner is his name, and he did it. It appears there's something about turning 100 years old that's causing people to feel the urge to take flight. "My grandmother has been saying for several years that one of her life-long dreams was to take a ride in a hot air balloon," Terry Visser said. Visser's grandmother's is Evelyn Jansma of Grand Rapids. She'll be 101 years old on Oct. 23 of this year. "I contacted Michigan Balloon Adventures, which is home-based in Mason, Michigan," Visser said. "When I told them the ride was a birthday present for my grandma, who was turning 100, they offered to give her the ride for free." Evelyn's ride may have happened 10 months after her 100th birthday, but some of the most memorable birthday presents come better late than never. Evelyn and several close family members and friends, gathered in an open field in Greenville, Mich., last Saturday morning. "This is something I've looked forward to for a very long time," said Evelyn, before she boarded the balloon's basket. "I'm excited because I got a telephone call from my grandson and he said, 'you want to go for a balloon ride on Saturday? "And I said, 'Yes I do; yes I do; yes I do.'" Once the balloon was ready to take off, Evelyn was lifted out of her wheelchair and placed inside the basket of the balloon. There was a seat put inside the basket for her to sit on. Moments later, captain Tom Burgeon lifted the balloon off the ground, and Evelyn was aloft. "Her balloon ride lasted about 40 minutes," added Visser, who accompanied her for the ride. "It's just great to be able to give back like this; seeing her face during that ride was priceless. "It's the ultimate birthday present for her. How many people can say they got a hot air balloon ride at a hundred years old, almost 101?" Captain Burgeon told Evelyn after the flight that her next free balloon ride will be for her 110th birthday, so she has a little more than 9 years of anticipation. An activity that roots all the way back to man's first dream of flight. An endeavour that despite its far beginnings still captivates a lot of enthusiasts in these modern times. Hot air balloon flights are still sought after. By those who want something different from any kind of aviation adventure. Something that everyone can enjoy with the smallest of preparation, zero skill level and less anxiety. It may be easy, simple and an activity within everyone's reach, still as with any outdoor activity there are risks involved. Avoidable ones, given the proper knowledge and safety briefing. Here are five ways to make this activity safe and successful. 1. Advanced research always pays off. Before you even start booking you balloon flight, it doesn't hurt to learn a bit about what they are and how they work. Do a bit of fact finding and read up on some comments of people who have enjoy balloon flights and seek a bit of expert advice from enthusiasts and operators as well. It also pays to do a bit of reference checking on the potential flight providers. 2. Hot air balloon rides are one of the very few activities that has little restrictions on who can ride. Almost anyone can enjoy a scenic hot air balloon flight, even people with physical disabilities. If you are undergoing medical treatment, make sure that you inform you pilot of it. Pregnant participants from six months on are not allowed to ride. Likewise, wheelchairs and oxygen tanks cannot be accommodated on board. 3. One of the prevalent injuries linked to hot air balloon flights is a broken ankle. Flat shoes or better yet running shoes are the most adequate footwear for this activity. Balance is important most especially when landing. You will be taught that the best position when landing is in a tucked position that will have you squat down leaning far back and holding onto a rope. It is advisable that you wear a long sleeved shirt during the flight. You may be positioned in the basket that is near the burner where the heat may be uncomfortable on exposed skin. 4. Never attempt to fly intoxicated or under any substance. This will alter your perception which can pose a very imminent risk to you and the people that you will be sharing the balloon ride with. This activity is full of that adventure high which is absolutely all natural. 5. It's a great idea to have kids enjoy a balloon ride, but one must have the good sense of realizing if they will really enjoy the flight or if it would be better to take them when they are at an age where they can truly appreciate it. Oftentimes, children younger than ten enjoy the first part which is inflation, and ground preparation. This is something new to them and they will be undoubtedly interested. Take off is a marvellous feat as well. But remember that flights usually take an hour or more and five minutes into the flight they may totally loose interest and ask for an early landing. It is a good idea to brief them of what the activity will entail from start to finish and then decide if they are truly up to it. It's the most basic yet one activity that is full of amazing sights and discoveries. In any chosen endeavour potential risks should always be kept in mind and prepared for. Hot air balloon flights may be a slow paced and relaxed activity, but this characteristic doesn't spare it from possible risks. Being aware, prepared and in the know will be an important factor in eliminating these risks and making this feat as enjoyable as it can get. Harold Gorton is a lover of hot air ballooning. He is also an experienced writer and enjoys sharing information and tips on hot air ballooning with other like-minded people. 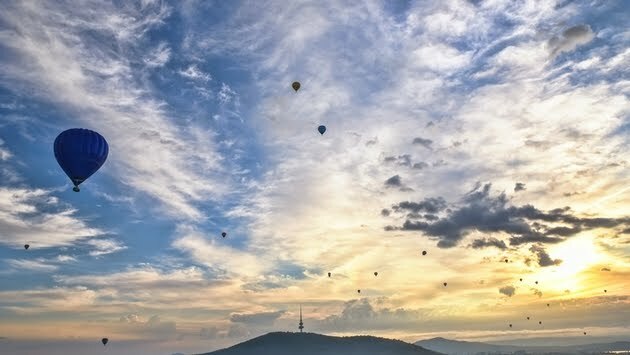 Harold Gorton has experienced and tried hot air ballooning all around Australia and recommends anyone interested in hot air balloon rides to give it a go!! How many balloons does it take to fly? The correct answer is one. And I am not talking of holding on for dear life at the end of a balloon on a rope. I am talking about a real balloon with a basket under it. What do you know about a hot air balloon? They look pretty on the pictures of all the balloon races. Brothers Montgolfier sent farm animals on the first ever balloon ride. Interesting isn't it? Here are some more facts about these gentle giants that grace the sky. 1. Hot air balloons were discovered in the Annonay France by brothers Jacques and Etienne Montgolfier. The first passengers on a balloon ride were animals, a sheep, duck and a chicken. The 8 minute flight took place on September 19, 1783. The brothers demonstrated that even at higher elevations, humans are still capable of breathing. 2. The first free flight by humans was on November 21, 1783 by Jean-François Pilatre de Rozier a physics professor and François Laurent d'Arlandes an infantry major. The vessel was a hot air balloon made by the Montgolfier brothers. 3. The longest balloon flight was by the Virgin Pacific Flyer piloted by Per Lindstrand from Sweden and Richard Branson from the UK. They flew from Japan to Northern Canada on January 15, 1991. 4. Balloon pilots are required to have commercial pilots fixed wing license. They must have these qualifications; a minimum of 35 hours of flight instruction, training for basic aviation, pass a written test for balloons and a flight check from federal aviation officials. 5. Balloon flights are not possible during rain. The heat from the balloon can cause rainwater to boil which destroys the balloon fabric. 6. The largest hot air balloon is the Energizer Bunny Hot Hare Balloon measuring 166 feet tall with a foot size of 98EEEE. 7. Milli Karlstrom from the United Kingdom became the youngest qualified female hot air balloon pilot on her 17th birthday in 2010. 8. Piball. This is an instrument that pilots use to see the exact location that wind blows. It is simply a helium filled balloon. This method helps pilots see if the wind may potentially bring the balloon into restricted airspace and dangerous locations. 9. Balloon flights have a chase crew. True to its term, this is a ground crew that follow the balloon's flight all through the entire trip. The chase crew have vehicles with room to accommodate passengers, the pilot and the balloon itself that can weigh over 250 lbs. 10. A champagne toast is a balloonist's tradition. Legends say that historic French pilots always had champagne to calm angry or petrified onlookers at the landing site. Modern times has taken this tradition and is commonly practised on commercial tours. Ten items is not enough to be in the know about hot air balloon facts. More interesting characteristics and heritage of this simple yet amazing activity will be imparted to you as you take on a flight. It is an absolute feat that transcends the modernization and evolution of aviation with that same heavenly feel of being in the air the old fashioned way. Harold Gorton is an experienced writer that is also a massive fan of hot air ballooning. He has enjoyed the sport from the moment he learned to hot air balloon through to his many hot air ballooning adventures across Australia. Harold Gorton thinks everyone can participate in hot air ballooning and hopes that more people participate in the sport. If you are interested in hot air ballooning you should find out more today and before you know it you'll be enjoying your very own balloon flights. Copyright © 2013 hot air balloon flight. All rights reserved.